Hire an attendant to supervise an inflatble, help operate a concession machine or any other helping hand during your event. 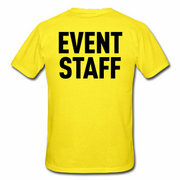 Our attendants can wear casuel wear, a company uniform or formal attire for weddings and other formal events. Price for attendat is $200 for up to 4 hours, with each additional hour at $50 per hour.